Also found in: Dictionary, Thesaurus, Financial, Idioms. the most important of the cordage fibers. It is obtained chiefly from the Manila hemp plant (Musa textilis) of the family Musaceae (banana family). It is grown mainly in its native Philippine Islands, where it has been cultivated since the 16th cent. ..... Click the link for more information. , class Liliopsida, order Zingiberales, family Musaceae. Considered a weed in Asia. The flower is edible. The root and stalk are edible. Juice from the stalk core is used to treat kidney stones. Sap is used as glue. Leaves can be used as plates or place settings. Banana Blossoms, also know as banana hearts. are a purple-red pointy growth at the top the trunk. Banana flowers can be eaten raw or cooked. Remove tough covering and eat the soft white inner part. Some varieties are too bitter. Soak in water to remove sap before eating. Wild bananas have large hard seeds. Bananas are one of the best sources of potassium, which helps heart, blood pressure, arteries. Bananas have antacid effect to help stomach ulcers. Great source of fiber to help elimination, constipation. Good source of fructooligosaccharides, which feeds probiotics. Green bananas help leaky gut and nutrient absorption. Commercial bananas may be treated with ethylene gas to ripen them, but also makes them bad for people with latex allergies. 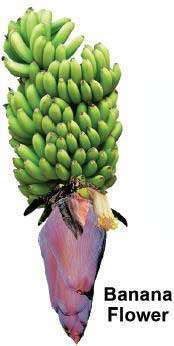 That’s why its better to grow your own :-) Bananas are also mood enhancers and mild sedatives. The potassium helps you sleep better. For white teeth, rub the insides of banana peel on teeth for 2 minutes. (Musa), a genus of perennial plants of the Musa-ceae family. 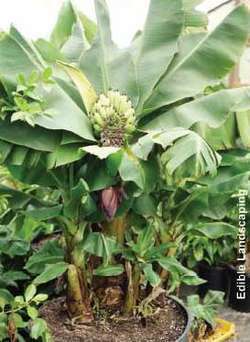 The banana is a tall, sometimes giant herb with a large rhizome and a short stalk. Its very large leaves are in sheaths that form a multilayered tube or false trunk. The young leaves and the inflorescence, which resembles an enormous brush, emerge through the false trunk. The flowers are unisexual and bisexual. The fruit is polyspermic, berry-shaped, and thick-skinned. In the cultivated forms the fruit is often seedless (the plants are propagated only vegetatively) and reaches a length of 15 cm and a diameter of 3–4 cm. As many as 300 fruit can develop on one axis; the total amount may weigh 50–60 kg. The aboveground portion of the banana dies after bearing fruit. There are 60–70 species of bananas in the tropics and subtropics of Africa, Asia, and Australia. The banana is an ancient crop, and for tropical regions it is a most important food plant and a major export item. 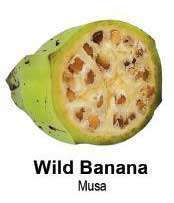 The most widely found cultivated bananas are the hybrid thermophilic species M. x paradisiaca and M. x sapientum (dessert varieties, or the so-called pisang) as well as the comparatively cold-resistant southern Chinese M. nana (M. cav-endishii). The fruit of the cultivated banana is 40 percent skin and 60 percent starchy, sweet pulp with undeveloped seeds. The pulp of a fresh banana contains 14–22 percent sugars, 5–8 percent starch, and up to 1.5 percent protein. The aroma of the banana depends upon the esters isovaleric-isoamyl and isoamyl acetate. The fruit is eaten fresh and dried, and it can be used to make banana flour, canned goods, jams, syrup, and wine. Some species of banana have fruit with a hard, starchy, sour pulp; they are used basically as livestock feed and are eaten by humans only when they have been fried or boiled. The textile or spinning banana (M. textilis) is grown as an industrial crop. A light, strong fiber called manila hemp (abaca) is obtained from the false trunks of this plant and used to make rope, fishing gear, and other goods. The Japanese banana (M. basjoo) is grown as a decorative plant in the USSR on the Black Sea coast of the Caucasus and the Crimea. The Abyssinian banana (M. ensete) is grown as a food and fiber plant in Africa. This species is now more often put in the genus Ensete (E. ventricosum). Alekseev, V. P. “Banan.” Biul. Vsesoiuznogo nauchno-issledovatel’skogo instituta chaia i subtropicheskikh kul’tur. 1955, no. 2. Zhukovskii, P. M. Kul’turnye rasteniia i ikh sorodichi, 2nd ed. Leningrad, 1964. What does it mean when you dream about a banana? Any of the treelike, perennial plants of the genus Musa in the family Musaceae; fruit is a berry characterized by soft, pulpy flesh and a thin rind. Freud suggested that all such objects have phallic implications. However, all types of food bring up issues of nourishment. In the world of classic or superstition-based dream interpretations, eating bananas suggests a period of hard work but little reward. Spoiled fruit usually suggests “spoiled” situations or friendships. STAFF at a construction company went bananas to raise money for charity. A ZOO keeper went bananas to raise money for charity, with the help of some ring-tailed lemurs. He went bananas when he came back, so I'll need to make sure I have a special sandwich for him on Saturday.